I'm taking some time off to be with my family and friends over the Christmas holiday! I hope you will do the same, and I'll see you early in the New Year. Think about all your art resolutions over the break! Cloth Paper Scissors presents a special edition, published by Interweave, just in time to help with your New Year's resolutions! Here is all the business and social media information you've been looking for, including insightful articles on how to get your price, get unstuck creatively, work your networks, fund your business, design your own space, get known, and give back to the world. 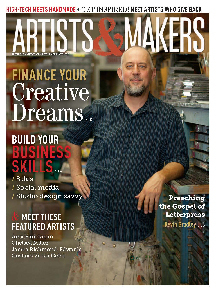 As well as all these great articles, the magazine features in depth interviews with five full-time artists: Chelsea Miller, knife maker; Kevin Bradley, letterpress artist; Gustavo Victor Goler, sculptor; Jamea Richmond-Edwards, visual artist; and Amy Barick man, artist, entrepreneur, and author. These make fascinating reading, as you learn how each of these very different personalities navigates the world of art and living. And now you've got a chance to check it out for yourself, and an extra-long time to sign up because of the holidays! 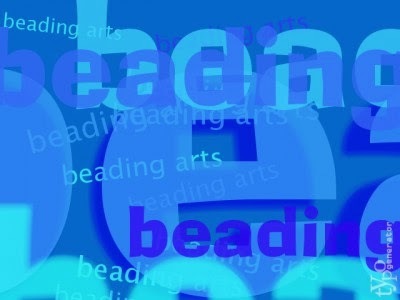 You know that I just have to read every book that comes out on bead embroidery, from the most basic to the most advanced. 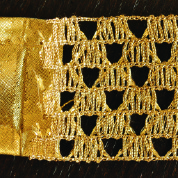 Except for the very most basic texts, you're almost sure to pick up a tip or two in each new book, and Textured Bead Embroidery by Linda Landy is no exception. 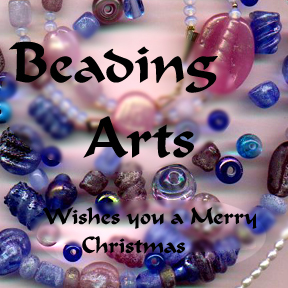 Although much of the material can be found in books you probably already have, I really really like the rather large section that Linda calls the Bead Directory. 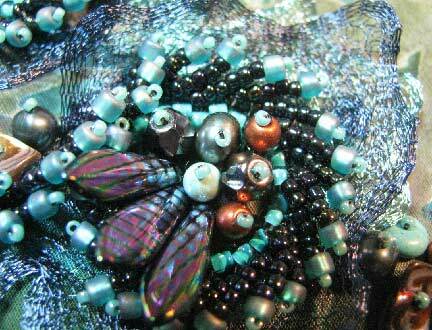 In it, she tackles the fun task of showing how many of the new shaped beads can be incorporated into bead embroidery. It's easy to forget just how many new shapes there are now! One of the techniques that Linda explains in the book is how to build support rows to make these beads behave too. The twelve projects are nice, and some are quite innovative. I really liked the Unleased pin. Instead of having the much more common donut as a focal, Linda has chosen an agate which has a druzy void in the bottom center. 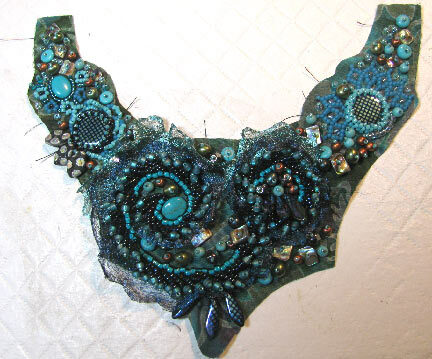 She uses this irregular hole to anchor some beautiful embellishments. I also liked a set of earrings that Linda calls Iconic earrings. 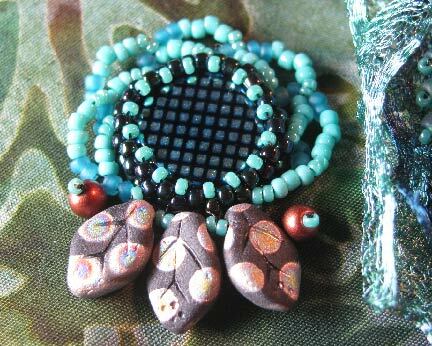 They are bead embroidered flat and then rolled into a cone. Very cool. You'll find instructions for necklaces, and bracelets too, like the Other Side of the Moon cuff shown above. This is a Kalmbach publication, so you know that the directions, photos, and illustrations have been carefully checked. Plus, there is a CD that has patterns for you to download if you'd like! 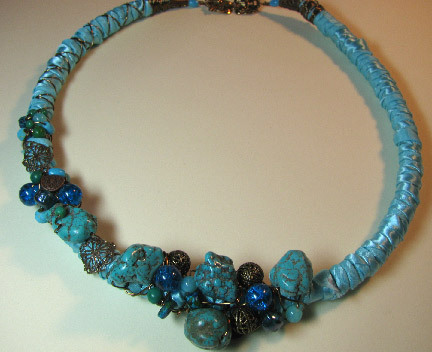 Here's a necklace that I made last month, intending to capture some of the feel of the Caribbean. Instead, what I got was more other-worldly. My friend Paul Bishop named it Midnight Sky of Distant Stars. Always the poet, our Paul! 1. Iron some lightweight fusible interfacing to the back of your foundation fabric. I picked a fabric with a wonderful pattern because I wanted to leave some of it visible in the finished piece. 2. 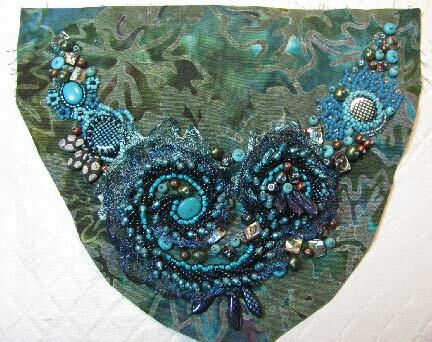 I created the centerpiece for the necklace by stitching the bead embroidered form of St Petersburg chain stitch (see Bored By Back Stitch, Chapter One). 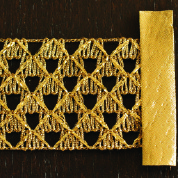 Around that double spiral, I stitched on metal mesh ribbon in three shades. 3. 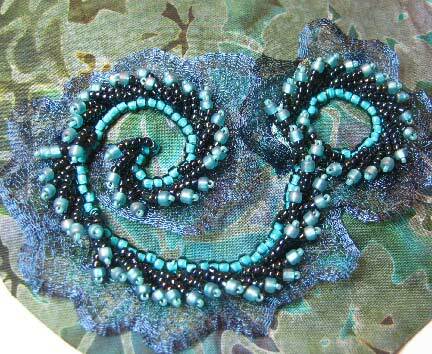 Add bead clusters and stacks around the spirals. 5. 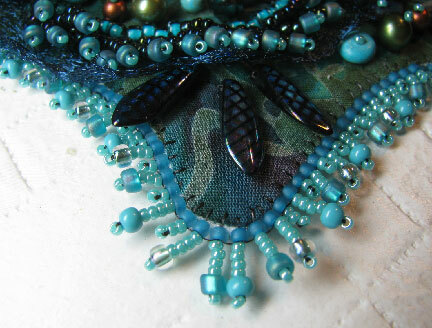 ...and some bead embroidered African helix. 6. Fill in around the focals, but not too tightly; you want to be able to see some of the pretty fabric. 7. Cut out the shape carefully. The original outline on the back is only a guide. Next week, I'll show you how to finish it all up! 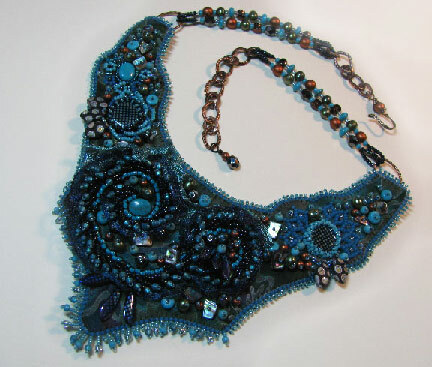 Is bead crochet on your list of new techniques to learn, or perhaps to master this coming year? 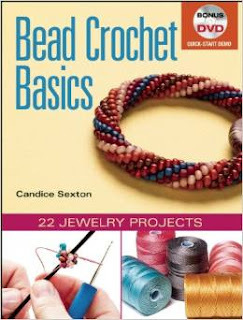 If so, you owe it to yourself to take a good look at Candice Sexton's new book--and DVD!--Bead Crochet Basics. Candice will teach you everything you need to know, and all in the perfect order. 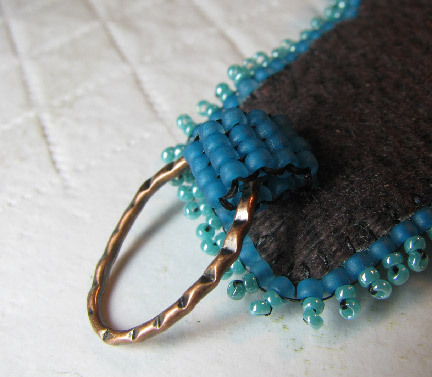 Twenty two projects are used to help you master ten essential techniques, which will take you from setting up to start, all the way through finishing ropes, invisible joins, trouble-shooting problems, and using some the newer shaped beads in your work. 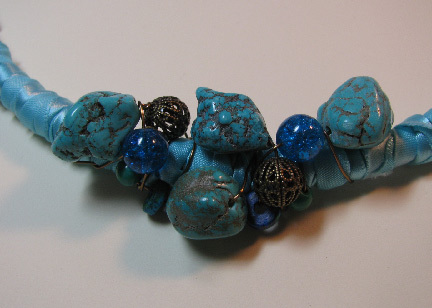 You know how much we love our shaped beads! Candice has you starting with larger beads and cords so that you can have some instant success without feeling like a klutz. She has a chart which will help you match bead size to cord, needle, and hook too. 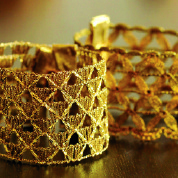 Before you know it, you'll be working with tiny little beads and beautiful complicated patterns! 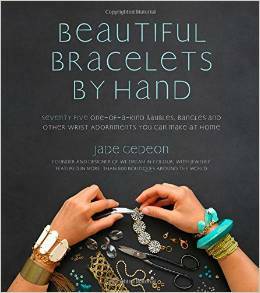 I am so excited to be able to share with you about a beautiful new book by Jade Gedeon, called Beautiful Bracelets By Hand. In it you will find 223 pages of awesomeness, starting slam bang with the projects. Beautiful close-up photos show you how to navigate any of the tricky steps, and a little techniques section in the back will refresh you on the basics you will need, as well as information on the tools and materials. I really like the way the book is organized, according to the main material being featured in the bracelet. 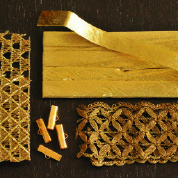 There are eight major sections, including beads, bits and pieces, chain, fabric and cord, leather, metal, plastic, and wood. There is some overlap between categories, of course, but I think you'll be very pleased with the organization, and how skills you'll come across early on will pop back up in later projects. 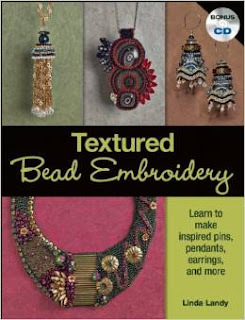 This would be a great book for someone who wanted to branch into additional areas of jewelry making, perhaps after having gotten started with basic stringing. 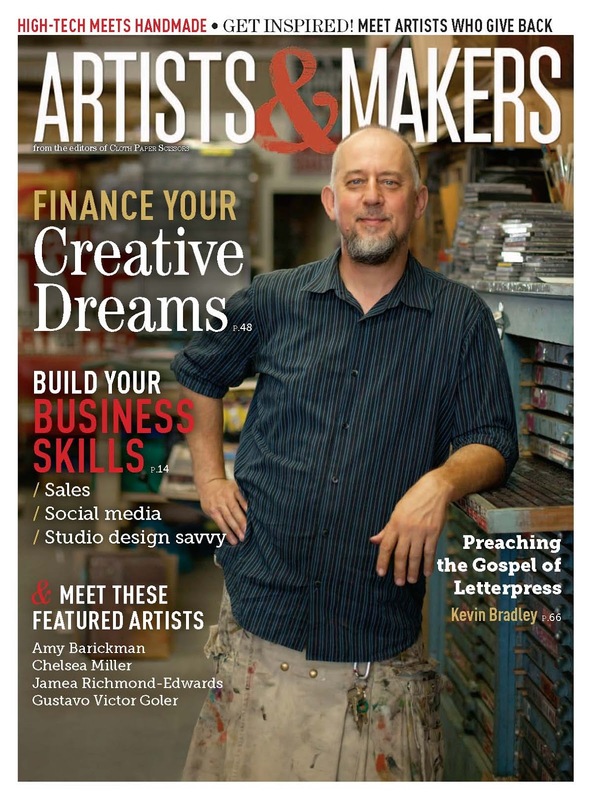 Both beginners and intermediates are sure to find lots of projects with immediate appeal! Now, here's the really good news...the publisher has made one of the projects from the book available for you (posted below) AND, they are offering a giveaway of one copy as well! Sign up for the giveaway and check out the sample project...you're gonna want this book! 1. Big wrist? Small wrist? Wrap ribbon around your wrist so it is slightly loose. tape about ½ inch (1.3 cm) longer than your ribbon width. (again with a card or something without nerves) the bias tape over the ribbon. 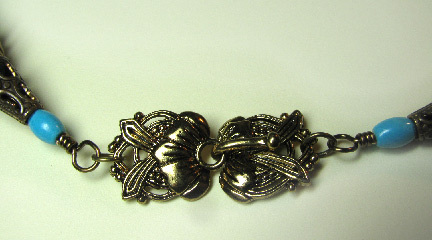 lobster clasp with a 4x6mm jump ring to the opposite end. Images and instructions are reprinted with permission from the publisher. 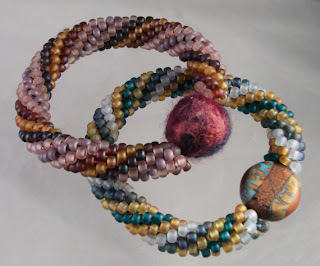 A few weeks ago, I showed you two double-wrapped bracelets that I made using Offray ribbon, which involved weaving the ribbon back and forth between two cords, and then scrunching it up for a more interesting texture. Well, I must have gotten really hooked on figuring out unconventional ways to use ribbon in jewelry making, because here we are again, this time making a necklace! 1. Turn a small loop in the 5" piece of wire, at least 1 1/2 times around for security, and crimp one end of the beading wire to it. 2. Thread the wire through the plastic tubing, and crimp the other end of the beading wire through a second looped wire as close to the edge of the tubing as you can. 3. 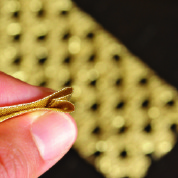 Cut your ribbon into a workable length. I found that 3' at a time worked well for me. 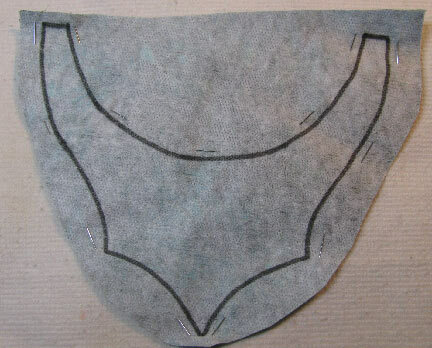 Cut one end diagonally as shown. 4. Using a tiny piece of tape just to anchor the first end up at the top near one 5" wire, twist and wind the ribbon around the tubing. When you get near the end of the ribbon, slide the wraps up towards the top as much as you can to compact them and make sure no tubing is showing. Use a second tiny piece of tape to anchor that end. 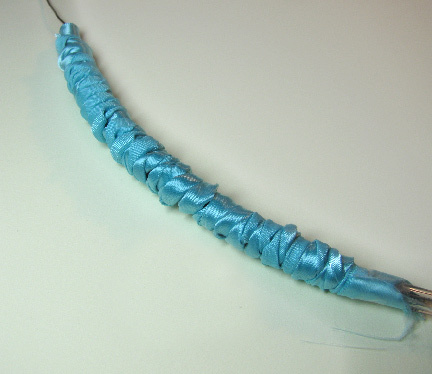 I found that 3' of ribbon created approximately 6" of wrapped necklace once it was fully twisted and smushed together. 5. Continue wrapping and smushing, using small pieces of tape to anchor ends until you reach the opposite end of the tubing. Wherever you start a new piece of ribbon, twist and cover the tape from both the previous piece and the current one with the working piece of ribbon. 6. 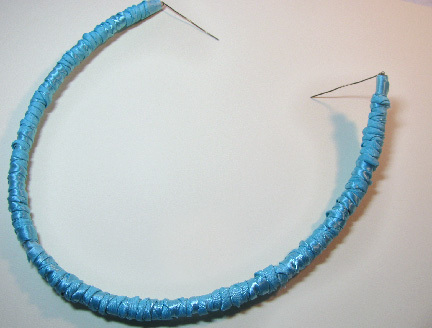 Use the 18" lengths of 20 gauge wire to hold the ends. You can still see a little bit of tape at the very end, but that will be covered in the next step. 7. 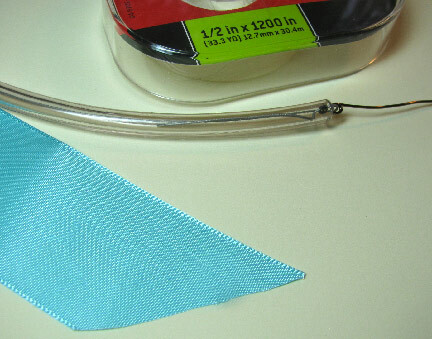 Add bead cones over the wires at each end and push them down to cover the tape. 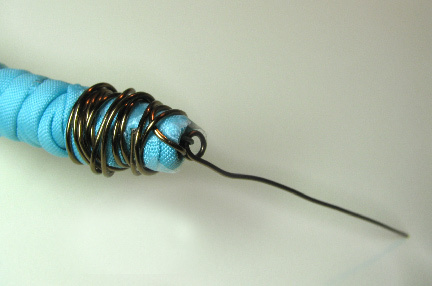 Add a small bead to the wire if desired and turn a wrapped loop. 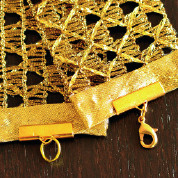 Use jump rings to attach the clasp to the wrapped loops. 8. 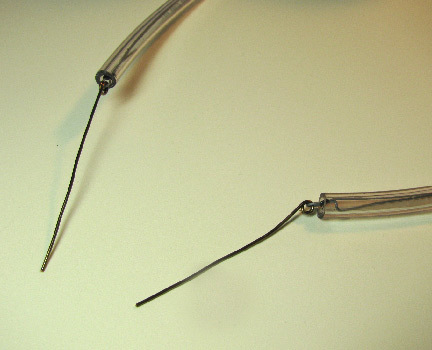 Cut a length of 22 gauge wire which is easy to handle. I ended up using 2' lengths (7 of them) to do my bead wrapping. 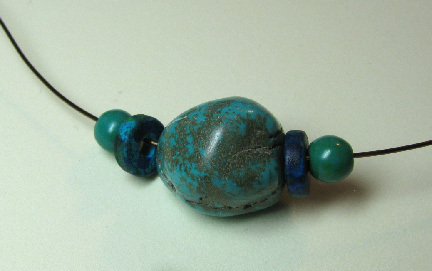 Center one of the large nuggets and a few other beads on the first piece of wire. 9. Wrap the beads onto the front side of the tubing in the center. 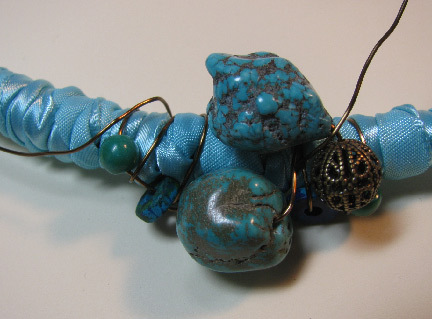 Wrap a couple of times, going between beads if desired. 10. 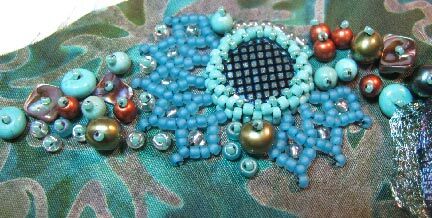 Add a few more large beads to the center area, using one of the wire ends. 11. 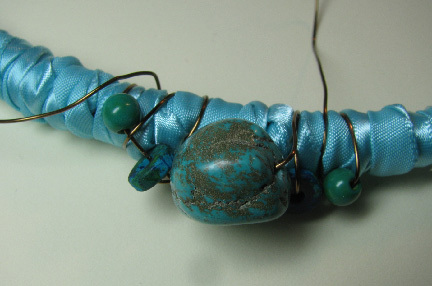 Continue wrapping outwards with that wire, adding more beads. 12. 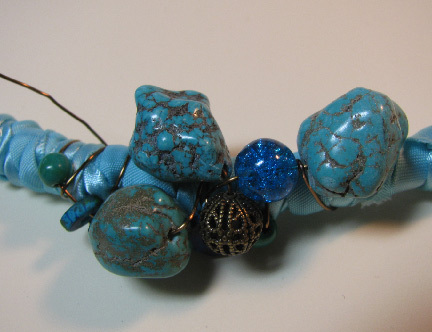 Use the other wire end to add beads to the other side. Strive for balance, but not symmetry. 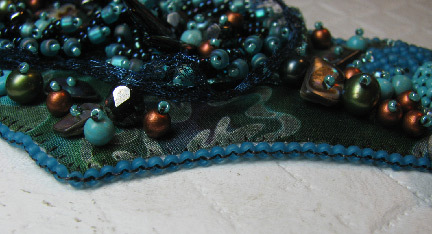 When the wire ends, tuck it under the ribbon, or beneath one of the beads. 13. 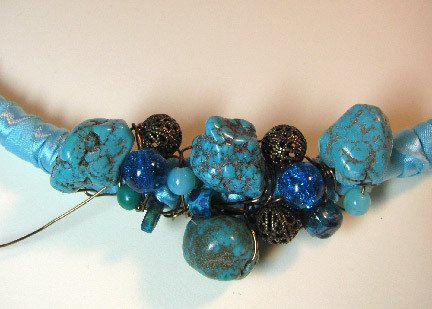 Go back, using a second piece of wire, and add smaller beads in between the large ones to fill out the center cluster. 14. 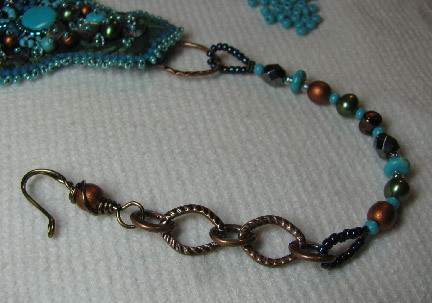 Add bent filigree pieces between more clusters of beads, wiring them on. After adding your final cluster, wrap the wire up the rest of the ribbon-covered tubing and back down. Add new pieces of wire as needed. 15. 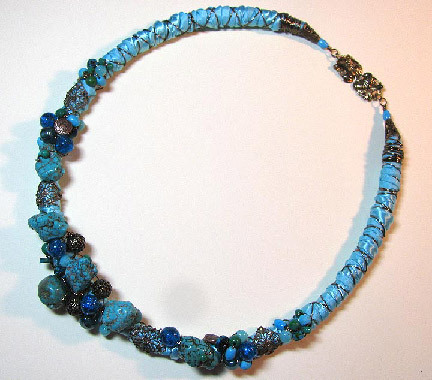 Add clusters and wrapping to the other half of the necklace. I used approximately the same beads in opposite clusters on each side of the necklace, but wrapped them on in different configurations. Elizabeth the first is the inspiration for this new necklace idea featuring vintage pink coloured pearls. These are my three winners, who will each receive a free copy of Interweave's brand new magazine, DIY Holiday! Congratulations, one and all!